When Mummy came in today she took us down from our run and put us straight in the garden. Vic and Hec and Humphrey were there already. We had lots of things to run through and jump in. Hec and I had a chase. We ate lots of grass. Colman and Kevin, the new boys, were there too. They stayed in their snugglesac mostly. We didnt. We ran around or ate grass. Dougall ate a lot of his from the end of a tunnel. His hair all came off yesterday. I expect it feels funny. It looks funny. This is what our grass looked like. I had fun on the grass. Whee had fun on the grass today too. Only it started raining so we didn’t stay out very long. 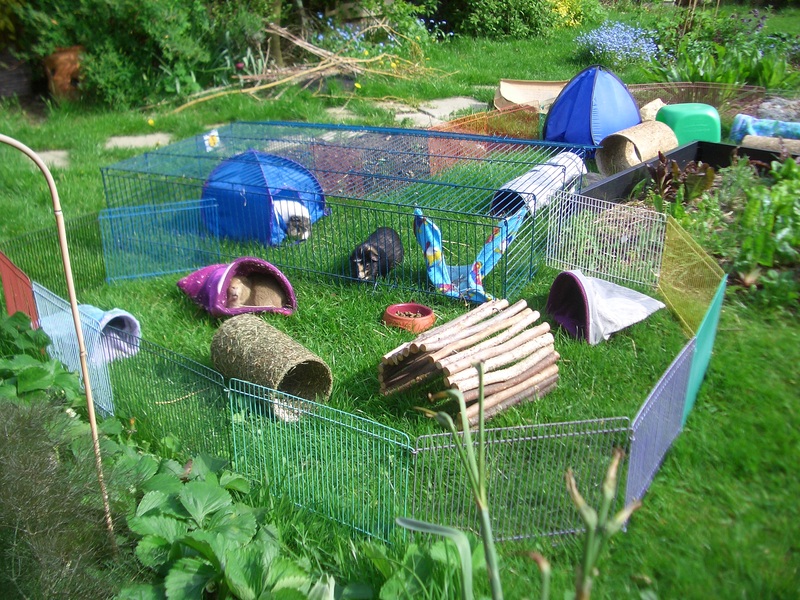 Whee are really jealous of your sunshiney-grass-fun-day! Wow! That’s a fantastic outdoor run. I hope you boys appreciated all the work Mummy did in setting that up. I’m glad that you had fun. I’m sure C&K will come out of their shells soon.